Ho Chi Minh City, Vietnam -- Vu Lan (Ullambana) festival, also known as the Amnesty of Unquiet Spirits, is held during the seventh month of the lunar calendar, which is believed to be the spirit month. Ullambana or Bon festival, the Festival of All Souls in Mahayana Buddhism, is celebrated on the seventh full moon of the lunar calendar in many Asian cultures as a way of honoring the dead. On this day, souls are believed to return to their former homes. The origin of the Sanskrit name of the festival, Ullambana, is uncertain but appears in early Buddhist holy writings known as sutras. These stories tell how Sariputra and Maudgalyayana, the two principal disciples of the founder of Buddhism, Gautama Buddha, saved their mothers from needless suffering after death. Oiginal idea of this ceremony is contained in the legend of Maudgalyayana, known as Muc Kien Lien in Vietnam, one of the 10 great students of Buddha, as well as in the Ullambana Sutra (The Buddha Speaks the Ullambana Sutra) which was translated into Chinese by Dharmarakya in third century and became very popular in Vietnam. According to the Sutra, Maudgalyayana, thanks to his divine eye, saw that his mother had been reborn as a hungry spirit because of evil actions in her previous life. He wanted to save her but as an Arhat Maudgalyayana could not save her by himself. The Buddha told him that only the combined effort of all Buddhist monks could soothe the sufferings of the tormented. He directed Maudgalyayana to organize an assembly of monks to make offerings for the benefit of his dead mother. Intrinsic to the seventh month is ancestor worship, where traditionally the filial piety of descendants extends to their ancestors even after their deaths. From India, these stories honoring the dead reached China and the Chinese assimilated certain Buddhist teachings into their ceremonies. 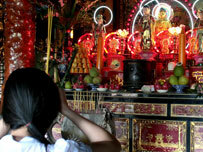 Strongly influenced by the traditions of its neighbor, Vietnamese families began celebrating Ullambana. The object of this ceremony is to feed the hungry ghosts and to pray for their salvation. This ceremony is a way for people to meet their compassionate filial duty. During the ceremony, offerings are made to rescue up to seven generations of ancestors from whatever misery they might be suffering. During the month, every family can choose a day to present a feast and burn joss paper and incense in front of the house to invite the spirits to eat. The most distinguished feature of the ceremony is the “offering snatching.” After the incense burns down, the neighborhood children are allowed to grab the food. No one will stop them as it’s believed the spirits may be angered if they do so. The ceremony is also a great chance for people to express their gratitude to their parents. The Buddhist holiday of Vu Lan, traditionally considered an important event in praise of motherly love, was celebrated nationwide on Friday. The Vu Lan festival has become exceedingly popular. It is closely connected to the Asian tradition of ancestor worship and filial piety. One of the traditions of this day is for people – Buddhists and non-Buddhists alike – who wish to express their gratefulness and appreciation towards their mothers, to go to a pagoda, often wearing a rose. Thousands of people flock to pagodas wearing red roses if their parents are alive or white roses if their parents have passed away. Developed by the respected Vietnamese Zen Buddhist monk Thich Nhat Hanh, this new aspect of the Vu Lan Festival quickly attracted younger generations. It started at the same time as the new development of Buddhism in South Vietnam in 1962. The noted monk said he was inspired by the flower-wearing tradition of Japanese people on their own Mother’s Day. The rose has been a symbol of love and sharing among parents and their children regardless of social background. “This festival is a chance for guilty homeless spirits to be pardoned. People worship ghosts and release animals, such as birds or fish,” said My Ngoc, a university student living in Tan Binh District. “I am going to the pagoda this year to pray for my mother because we are miles apart. My mother is living in my hometown in the central province of Binh Dinh. I always think of her,” Ngoc said. Ngoc said her father had passed away a few years ago and she would do lots of good things to try and help him. “Although nowadays the youth live faster and are becoming more unfamiliar with traditional values, they still deeply love and respect their parents,” visitor Duc Phong said as he strolled around Vinh Nghiem Pagoda, the most famous Buddhist temple in Ho Chi Minh City. “That’s why many youngsters visit pagodas and present their parents with flowers on this day,” Phong said. The diversity of the Vu Lan festival can be seen throughout the city with many different activities. Most restaurants and hotels, especially in District 5’s Chinese quarter, offer vegetarian buffets and promotions for parents and senior citizens. The Suoi Tien Theme Park in Tan Phu Ward in HCMC’s District 9 offers many activities for the event, including cai luong (traditional Southern opera) performances depicting the story of Maudgalyayana and his mother and a free vegetarian feast for everyone with eight different dishes. The activities last until tonight. While the Westerners have Mothers’ Day to be proud of, Vietnamese treasure their seventh lunar month festival in general and the Vu Lan day in particular as a time to pay tribute to their loved ones, dead or alive.